Kiribati Community in Fiji during memorial service at Kiribati High Commission in Fiji for the passengers of sunken ferry MS Butiraoa on February 10, 2018. Photo: Ronald Kumar. 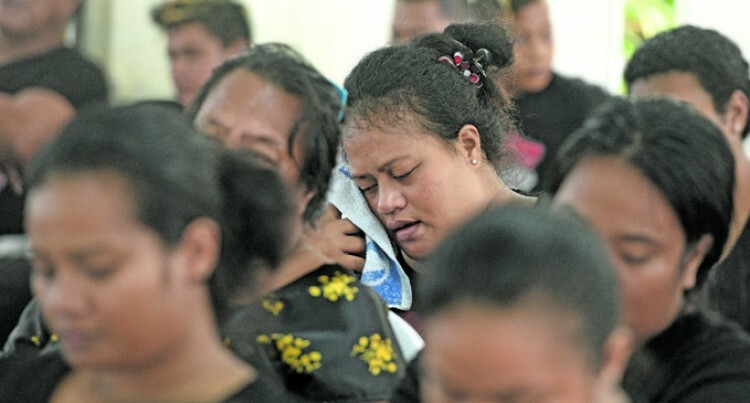 A memorial service for the 81 Kiribati people who died at sea last month was held at the Kiribati High Commission on McGregor Road, Suva yesterday. More than 300 Kiribati residents living in Fiji, a Kiribati govern­ment delegation and non-govern­ment organization representatives paid their respects by signing a book of condolence at the Kiribati chancery. Kiribati High Commissioner to Fiji Retata Rimon said it was a very sad event. He hoped that “Almighty God would be with the families and friends of those who sadly perished in the boat”. Pacific Islands Forum Secretary General Dame MegTaylor extended the forum’s deepest sympathy to the Kiribati community at the me­morial service. “The Kiribati family here in Fiji on behalf of the Pacific Islands forum and my colleagues, we ex­tend our deepest sympathy and our prayers to the people of Kiribati and the families who have lost their children and other families. “Whilst the service was conduct­ed in the Kiribati language I was thinking why is that we all come together here when we are from many different parts of the Pacif­ic,” Dame Taylor said. “”The people are one family be­longing to the great ocean of the Pacific. “Everything that happens we should share and we must under­stand it. “When there are times of great joy, when one of the countries wins rugby, when there are festivities that are enjoyed together but when there was a tragedy what made the Pacific different was that the differ­ent communities get together. Minister for Finance for the Kiri­bati Government Teuea Toatu said death is a final destination for peo­ple. He said amongst those who per­ished were a number of students who were expected to start school last Monday. The memorial service began with a prayer service and words of sym­pathy from invited guests followed by a feast.